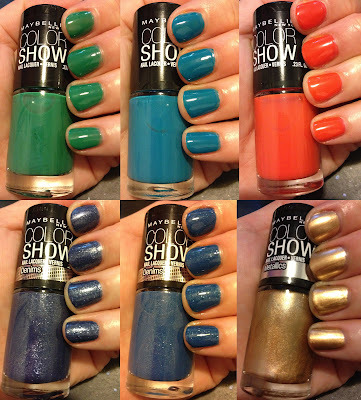 The Beauty of Life: Maybelline Color Show Nail Lacquer Swatches: My Top 6 Picks! Maybelline Color Show Nail Lacquer Swatches: My Top 6 Picks! Have you heard about the new Maybelline Color Show Nail Lacquer? 40 -- yes, you read that right, 40! -- colors make up the brand's new collection, in every color of the spectrum. Read on to see my top 6 of the collection. All are seen with two coats. Tenacious Teal didn't actually seem teal to me at all. I don't see any teal in this color -- it came out more as a kelly green for me, much like OPI Don't Mess With OPI. Easy application, pretty if not totally unique, but definitely a keeper. And maybe it would look more teal in different light. Shocking Seas is a gorgeous turquoise. It calls to mind the waters of the Caribbean or Hawaii for me. Really easy application and very glossy finish, even without topcoat. I think this would look fantastic as a summer pedicure. Orange Fix definitely stood out for me, since I'm going through an orange phase right now! I love how bright and bold this color is. It stood out to me from the masses and it's definitely going into my long-term stash. Styled Out is one of the colors from Color Show's Denims line. Out of the six pictured here, this is the only one that needed topcoat -- it applied very matte without, which still looked great, but I'm a glossy nail polish girl. I suggest applying thin coats with this one, as it can get gloppy if you have too much on the brush. But I absolutely love the color -- it looks exactly like dark denim, with a touch of silver sparkle to really make it shine. Denim Dash is another polish from the Denims line. I equate this color to your favorite pair of jeans -- just the right shade, just the right amount of wearing in, just super perfect.I love the indigo hue with silver micro glitter. Bold Gold is, obviously, gold! It's very metallic, which I thought would give me application issues or weird streaking, but it did neither. It applied easily and smoothly, with little to no brush marks. I love this one for a fancy night out -- and, as golds go, I think it's pretty unique. All 40 shades are available for $3.99 each at drugstore.com . Denim Dash & Bold Gold would pair awesomely together!! Every item I walk by the display, I reach for the green but haven't splurged yet. Love those denim colors. Definitely going to keep an eye out for those!